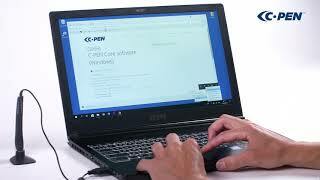 C-PEN TS1 is a USB connected text scanner/digital highlighter. It works connected to a computer (PC/MAC). When activated, a light turns on and highlights the text – text that instantly appears by the text cursor in the application active on the computer. Simply mark up some text, as if doing it with a marker pen, and the text appears in the open application on your PC or MAC. Capture notes and quotes from textbooks and papers. Input numbers and data to business systems. Real time Optical Character Recognition (OCR) supporting 100+ languages in Latin, Cyrillic, or Greek alphabet. Text and numbers or numbers only. Compatible with MS Office and endless other 3rd party text/data software. TS1 Digital Highlighter support 100+ languages. Supports USB, and is compatible with Windows and MAC. TS1 Digital Highlighter is probably the most compact and robust scanner pen on the market.